Riverside County is already one of the nation’s clean energy hot spots. If you’ve driven from Los Angeles to the Coachella Valley, you’ve seen the iconic wind turbines in the San Gorgonio Pass and the solar panels that cover thousands of rooftops. Drive further east on Interstate 10, through the open desert, and you’ll pass four of the country’s biggest solar farms before you hit Arizona. Now, the county is poised to generate even more climate-friendly energy. 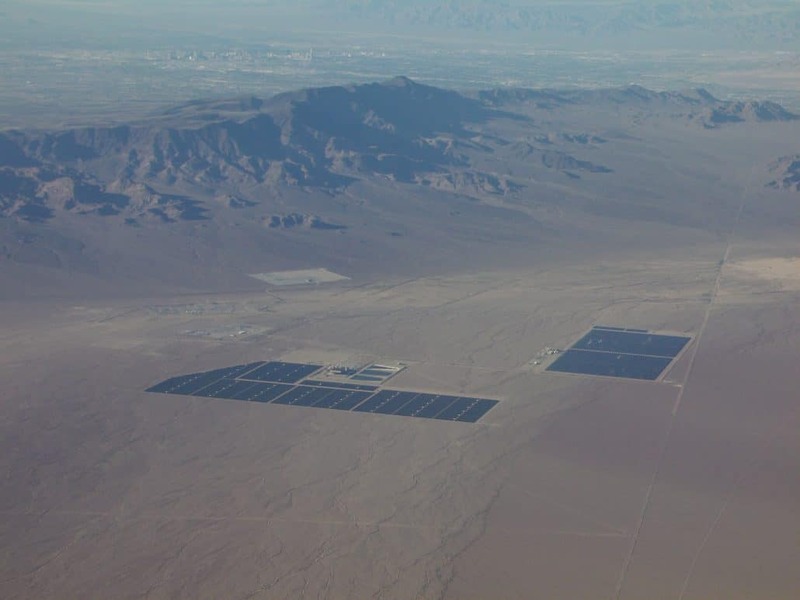 EDF Renewable Energy has struck a deal to sell electricity from its 150-megawatt Desert Harvest solar project to Marin Clean Energy, a Bay Area power provider. The San Diego-based developer can now start construction on the long-awaited project, which will be built on 1,200 acres of federal land just south of Joshua Tree National Park, next to the existing Desert Sunlight solar farm. The Desert Harvest contract bodes well for the future of clean energy, which experts say will continue to grow even if President-elect Donald Trump aggressively supports fossil fuels, as he pledged to do during the campaign. That growth will be fueled by solar and wind power, which are now the cheapest sources of electricity across much of the country, out-competing coal and natural gas. The Desert Harvest contract is also good news for supporters of community choice aggregation, a new business model through which local governments ditch their utility and buy electricity directly from power plants. Marin Clean Energy, which has been around since 2010, was California’s first community choice aggregator, or CCA. It now provides electricity that’s significantly greener than the alternative offered by Pacific Gas & Electric, for a comparable price. And it’s growing, expanding its customer base from 170,000 to 255,000 this year as more Bay Area cities chose to join. Riverside County is studying whether to form a CCA, as are San Diego and more than a dozen Los Angeles-area cities. A study commissioned by Riverside County earlier this year found that homes and businesses in unincorporated areas alone would save nearly $8 million annually through community choice, with the average home saving between $50 and $55 annually. EDF has talked to officials in Riverside County and other areas looking at community choice, Black said. EDF first proposed Desert Harvest in 2009, winning approval from the federal Bureau of Land Management in 2013. Along the way, the project faced opposition from conservationists who feared it would disrupt habitat critical to the desert tortoise, which is listed as threatened under the federal Endangered Species Act. But two of the major protesters — Defenders of Wildlife and the Natural Resources Defense Council — dropped their objections after the developer agreed to concessions, such as buying private land near the project and setting it aside as protected habitat. EDF’s other big solar proposal in Riverside County, the 500-megawatt Palen project, is much more controversial. Conservationists and tribal groups have slammed Palen, saying it would disrupt Mojave fringe-toed lizard and desert tortoise habitat and destroy ancient Native American artifacts and sacred sites. The project is currently being considered by the Bureau of Land Management. But while Palen faces major hurdles, EDF now has everything it needs to start building Desert Harvest. It’s not clear when construction will begin — EDF isn’t under contract to send electricity to the Bay Area until late 2020, which would put the start of construction-related activities around mid-2018. But Marin Clean Energy, officially called MCE, could end up needing the clean energy sooner if it keeps adding new customers. EDF would work start earlier if that happens, Black said. The developer estimates Desert Harvest will employ an average of 100 people during construction, peaking at 250 workers, and then employ eight permanent staff once it’s built. According to the contract with Marin Clean Energy, the project should generate up to 490,000 megawatt-hours of electricity annually — enough energy to power 73,000 average California homes. That electricity will help Marin meet its rising demand for clean power, while still offering similar rates to Pacific Gas & Electric. Marin’s customers can choose a 52 percent clean energy mix or a 100 percent clean energy portfolio — currently priced at 50 cents less per month and four dollars more per month than PG&E, respectively. In the last year alone, Marin has signed contracts for 445 megawatts of California solar power and 167 megawatts of California wind power, according to Byron Vosburg, the CCA’s manager of power supply contracts. Overall, Marin has committed $1.4 billion to 813 megawatts’ worth of renewable power projects in California, Vosburg said. Riverside County’s board of supervisors took another step toward forming a community choice aggregator last week, unanimously approving contracts for the New York-based consultant Good Energy and the Oakland law firm Keyes, Fox & Wiedman to write a business plan for the county. If everything goes smoothly, the county could present its plan to the California Public Utilities Commission by mid-2017 and launch its CCA by the end of the year, according to Brian Nestande, the county’s deputy executive officer and a former state assemblymember. Nestande first urged the county supervisors to consider community choice last year, pitching it as a way to save people money and increase the county’s share of climate-friendly energy. He quickly won the support of John Benoit, who chairs the board and represents the Coachella Valley. On its own, the county can only launch a CCA for unincorporated areas. The Coachella Valley Association of Governments, the Western Riverside Council of Governments and the San Bernardino Associated Government commissioned their own feasibility study to determine how much money their member cities could save through community choice. That report, which was finalized last month, found that if the three government associations form a single CCA, they could offer their customers a 50 percent clean energy mix while cutting electricity costs 3.7 percent below Southern California Edison’s rates. A 100 percent clean energy portfolio would cost 3.7 percent more than Edison would otherwise charge, the consultant found. The three government associations are discussing different CCA structures and have talked to Riverside County officials about the possibility of forming a single community choice aggregator for the region, said Katie Barrows, director of environmental resources at the Coachella Valley Association of Governments. So far, there are four CCAs in California: Marin, CleanPower SF and Sonoma Clean Power in the Bay Area and Lancaster Choice Energy in the Southern California desert. Together, they serve more than 750,000 customers. State lawmakers authorized local governments to form CCAs in 2002, building on a model pioneered in Massachusetts. Utilities have sometimes pushed back against community choice: PG&E spent $46 million to bankroll Proposition 16, a failed 2010 initiative that would have made it harder for CCAs to get started by requiring a two-thirds public vote. San Diego Gas & Electric recently formed an independent marketing division, paid for by investors, to discuss San Diego’s proposed CCA. Community choice advocates have criticized the California Public Utilities Commission for approving the marketing division, saying SDG&E is gearing up to lobby against the CCA. Southern California Edison has said it is “neutral” on community choice. If Riverside County forms a CCA, Edison would still operate the power lines and possibly send out electricity bills, but it wouldn’t have any other role. Last year, 25 percent of Edison’s energy mix came from renewable sources like solar and wind, and it’s required to increase that percentage to 33 percent by 2020. Another Big Solar Farm Coming to California Desert, by Sammy Roth, The Desert Sun, December 20, 2016.